How to Solve Wrong Salary E-mail ID Problem of PIFRA? Haven’t received your March, April and May Payslip? Assalam-0-Alaikum and Welcome to Tech Urdu! Guys I’ve already made a video of How to register on PIFRA and get your Employees Salary Slip on your Email. I’ve received a number of question regarding wrong gmail problem on PIFRA like how to unsubscribe? How to change ID? How to remove old ID? How to recover Password? etc and other such questions. 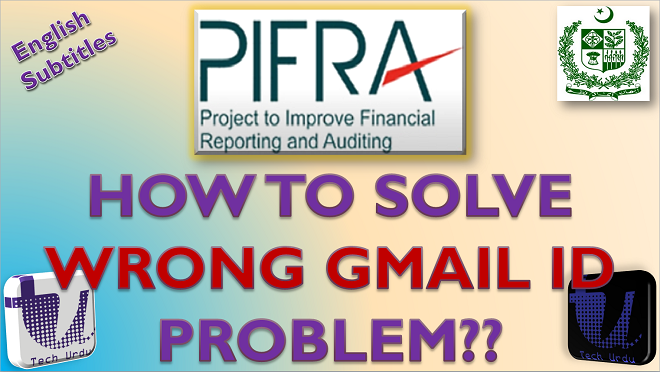 In this video, I’ve tried to solve these problems and showed a different way to contact PIFRA and solve your wrong or forgotten email id problem. Still, if you face any problems please let me know. Well, well, well, I got a lot of questions regarding PIFRA Monthly Salary Slip. Though I have already uploaded 02 Videos on the topic yet it seems a lot of problems are being faced by you guys. Disclaimer: These videos are not being uploaded from PIFRA Official Forum. The purpose of these series of videos is only for Educational and Learning purposes. Sir ‘ pichly september mahiny sy salary slip by email ni aa rhiii please batain kya problem hy??? Register kb kea tha and is sa pahly slip i hai? Means k June sa ab tk aap ko slip nhi mili? Registeration tu theek sa kea aap na? First you need to unsubscribe from old id then register with the new id. I have already made videos on this. kb sa slip nhi mili aap ko? It is not us who sends salary slips to you people. it is rather PIFRA who does the job. That is good k aap already registeration check kr chuky o. Dekhny ma aaya hai k pifra ki tarf sa april and may k slips aksar logo ko nhi mily hai. so hopefully aap ko is month mily gi. still app spam and promotions tab must check kry. Mere . e-mail ma795373@gmail.com iska posword bhool giya ho .. so plz meri iss email ko unsubscribe ker den ..ya meri dosri e-mail pe log in ker den …. mahboobali00786110@gmail.com iss pe ..
Unsubscribe aap ko khud krna prta hai. Aap aik email pifra ko likhy aor un sa yahi request kry k mery old id ko unsubscribe kry. (details video ma deay huy hai plz check kry) phr b koi prob o aap pouch skty hai. If you are asking that your DOB is wrong in slip and you want to correct it then go to the District Accounts Officer / Accountant General Office and you can rectify your data there. If you are asking generally then you need to proceed through Court – Qazi Court. Me apni e-mail ka posword bhol chuka ho … lehza meri ye e-mail unsubscribe ker den ..
Phr me apni dosri e-mail pe log in kro . Iss Email log in kronga ..
RECLAMATION AND PROBATION HOME DEPARTMENT SINDH . Walekum Assalam dear. App ki email yahan sa unsubscribe nhi hogi. Aaap apny email sa pifra ko unsubscribe krny k leay email kry. wo aap k id ko unsubscribe karengy. jb wo unsubscribe kry us k bad ap new id sa register o sko gy. Yes pifra sa id ko unsubscirbe krny k leay unsubscribe@pifra pa email krna prta hai. Details video ma deay hai plz watch video. First, you need to UNSUBSCRIBE from that Account. Then Register a NEW Account on this one then you’ll get your slips on this one. Feel free to ask any problems you face with. ID kb bnai thi? Means k kitna time hua hai ID ko? Sir If i changed my gmail password….then can i get my pay slip or not….bcz last month i changed it but yet i dnt receive my pay slip. Changing password has no effect on getting pay slips. Wait for couple of days and then let me know. dear no need to share your personal information here. simply call pifra or email them and state your issue there. send your problem for the gmail id you want to be as your mailing id. hope you understoord what i want to say. still feel any problems feel free to ask. Mira Salary Slip Ghalati se Ghalat Gmail par Open ho gaya hai..
os gmail ki id pr mira Facebook account hai..
dear salary slips are sent by PIFRA. Wait for the month to end and you’ll get your salary slip. To change email address, first, you need to unsubscribe from older email and then register with new one. agr gmail completely bhool ghy o then it is problem. aap ko kuch tu yadd o ga? kis no pa tha etc. ya kisi aor email jaisy yahoo ya hotmail k sath link tu o ga?? Salam sir mera nam naveed khalid hy meine pifra pr pay slep k li ID bani thi or mera ID galat likhi gai hy kia wo gllgle id change ho sekti hy. I forget my password how can I solve it. first you need to unsubscribe from it then you can go for a new one. what is the status of your pay slip? When did you apply for it? Did you get any email (confirmation) etc from pifra?